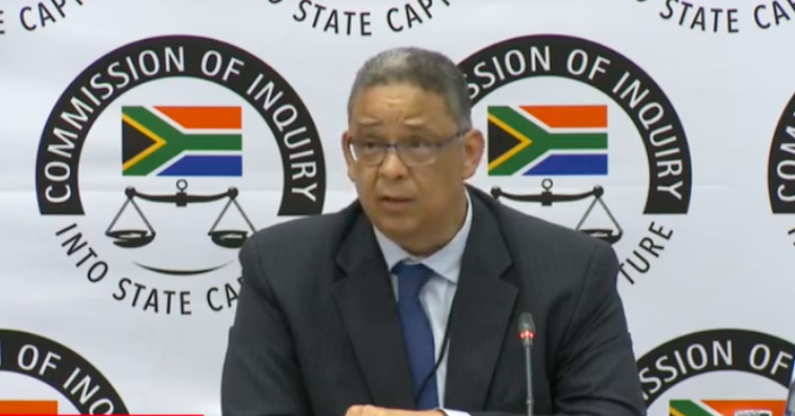 The commission of inquiry into state capture has heard a recording of a phone call, where independent Police Investigative Directorate (Ipid) investigator Innocent Khuba is allegedly offered his job back if he implicates his boss Robert McBride in wrongdoing. Former Ipid head McBride presented the recording during his fourth day on the witness stand. He was suspended in 2015 after former police minister Nathi Nhleko appointed Werksmans Attorneys to investigate whether McBride, Khuba and another investigator, Mathews Sesoko, were guilty of fraud for allegedly altering a report on a case involving the deportation of Zimbabwean nationals. Sometime later Khuba was also suspended and another IPID official, Mandla Mahlangu, made the call offering him his job back. In the recording, a man alleged to be Mahlangu can be heard telling Khuba that former Hawks boss Berning Ntlemeza was his friend and he should not side with the enemy, referring to McBride. Ntlemeza replaced former Hawks boss Anwa Dramat, who has forced out office based on false information implicating him in the rendition case. "Khuba indicated that at some stage in November 2013, who was known to him through police investigations and was then the deputy provincial commissioner for Limpopo, approached him interested in the rendition investigation. This was in 2013 before I arrived, so he was interested and the message was: You are holding me back in my progress in my career," said McBride. He added that during the same period, a National Prosecuting Authority (NPA) advocate, Anthony Mosing, put a lot of pressure on Khuba to conclude the rendition investigation. McBride also alleged that Ntlemeza told Khuba in 2014 that he must watch the media as Dramat would be removed. Khuba is expected to testify at a later stage. The commission heard another recording, where Mahlangu was on a call with another Ipid official who told him that McBride “was going down”. In the recording, which is said to have been recorded during a phone call in 2018, the Ipid official offers Mahlangu a job and tells him not to worry about whether he has experience or is able to discuss sensitive cases.